Based on reviews from 47 experts and 6,018 users. Learn how our rankings work or see our guide to red football boots. Updated Apr 2019. When taking turns and executing game-winning plays, athletes need a football boot that performs with excellence and precision. Then again, it wouldn’t hurt if it made players stand out on the pitch not only in performance but also in terms of look. Colorways are one of the avenues players get to express who they are as athletes or who they want to be once they step into the playing field. 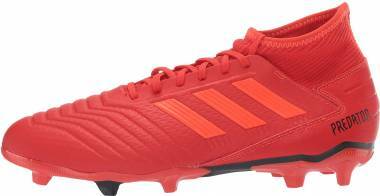 One of the more vibrant color options seen on the pitch is red football boots. 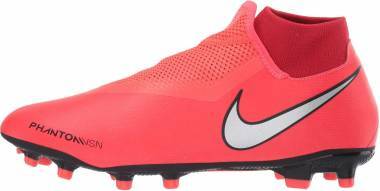 Red football boots are bold and highly visible on the pitch, making it one trendy choice among football players. As research would suggest, red is the color of fire and blood. It is symbolic of energy, strength, and power that are most often embodied in football players absorbed in the intensity of the game. It also depicts determination and passion, traits that are deeply rooted in athletes engrossed in the sport they love. Whether alone or combined with other colors, red is always one captivating color that is sure to get wearers noticed on the pitch. The different football cleat brands have integrated this versatile color into the colorways of their top silos. Let’s get a rewind. In the beginning, football boots were only available in one primary color - plain black, or black with white or silver linings. They only varied in size and weight. The traditional black football boots came to an end in the early 1970s. It was Allan Ball who first wore a pair of Hummel white football boots during a Charity Shield game. Those boots were actually Ball’s trusted Adidas cleats which were painted white and added with Hummel chevrons to look real. Ball’s guts to wear a different color of boots caught so much attention that it was even featured on the television. This has influenced so many players including Charlie George who first wore a pair of red football boots. Since then, other brands began introducing non-black football boots. Players like Marco Simone and Martin Keown who were both known in the nineties were also seen wearing red boots. 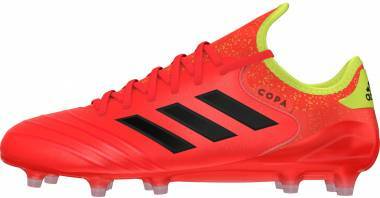 Red football boots are mostly preferred by the impetuous players. They intend to set off an impression on others including the referee, that there is no hiding place on the field of play. Since Charlie George paced through the pitch wearing the first pair of red football boots, it didn’t take long before cleat manufacturers infused a hint of crimson in their boot collections. Over the years, designers have definitely put their creativity up front, coming up with red football boot releases that steal the scene in the football world. 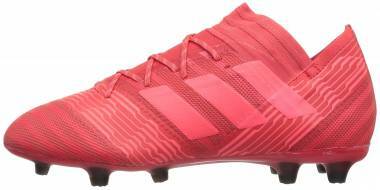 When Adidas released the Red Limit Pack as its pre-Christmas 2016 collection, it stole so much attention on the football boot market. 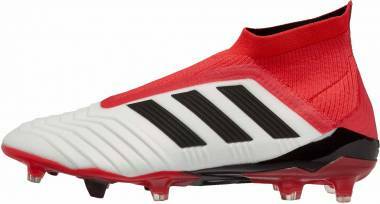 This red football boot collection took inspiration from the brand’s traditional yet famous colorway of red, white, and black that mostly composed the Adidas Predator. 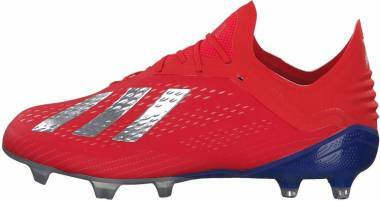 This color scheme is used in more classic applications and different compositions on different Adidas football cleat models. Hailing from the legendary Copa silo, the Copa 17 Red Limit is the first in its line to feature a colorway that deviates from the classic black and white. A striking red hue runs from the vamp to the midfoot, contrasted with black lateral stripes. Meanwhile, white paints the heel area. This red football boot carries the genes of its ancestors, but it is different from them because of its modern take on the all-time classic boot. It wears a K-leather upper alongside a compression tongue and a Sprintframe outsole. Red on top and white on the bottom, that is how you will get swept by the Adidas Messi 16+ PureAgility Red Limit. It carries the same innovative construction that the Messi 16, which delivers speed and agility without sacrificing comfort and control. The AgilityKnit upper in red is meant to give a lightweight feel and a snug fit. 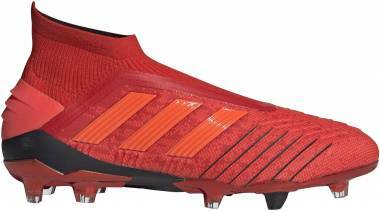 For enhanced lockdown as well as a cleaner strike zone, Adidas applied the Purecut sock system into this red football boot. Limit reached for the Red Limit Pack! 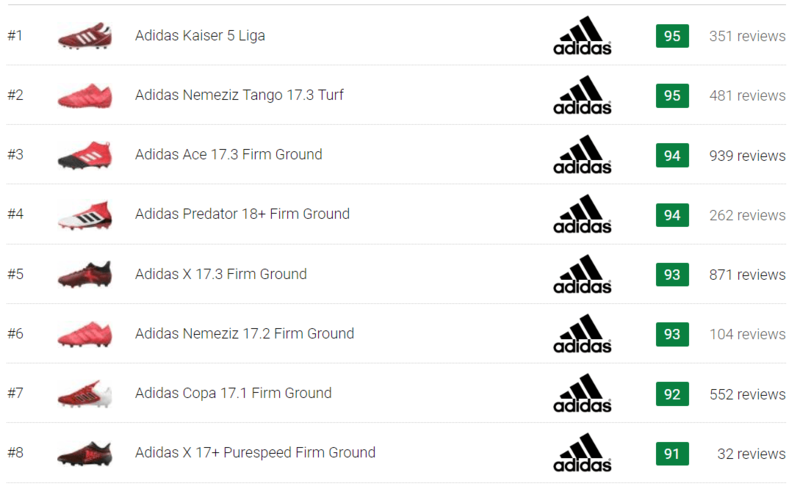 The Adidas X 16+ Purechaos completed the collection. More vibrant than the bright Solar Red edition, the Red Limit edition brags a colorway with black that blends from the Purecut sock system into the heel, and red on the entire upper and front part. Tech wise, this red football boot remains unchanged - laced and covered up. With the intent of bringing fresh football boots to the field, Nike revealed its Fire and Ice Pack collection around October of 2017. It is the fiery red or widely known as the Universal Red for Fire, and the chilly blue or the named Gamma Blue for Ice Pack. There are a total of 14 options in both low-top and Dynamic Fit Collar versions, making it Nike’s largest pack ever. Initially released for basketball shoes, the Fire and Ice Pack immediately became a big hit in the football world. The Hypervenom Phantom III Elite DF FG is made for the attacking player. With its super-strong and ultralight Flywire cables, this red football boot is meant to secure superior lockdown. It also features a flexible forefoot Hyper Reactive plate for responsive stability that allows to change and cut direction in a speedy manner. The strike zone of this boot optimized a hyper-reactive texture for a sure shot velocity. This boot also boats its ACC (all conditions control) technology that gives precise control on both dry and wet conditions. Known for its unparalleled speed, the Nike Mercurial Vapor XI FG combines a super lightweight nylon plate with a cutting-edge stud and an upper with embossed ridges perfect for a fast-paced game. The synthetic leather upper with its textured ridges is intended to help achieve more ball control. For impressive comfort and support, this boot used the compressed nylon plate that contours to the foot. To make sure on its weather adaptability, Nike used the ACC (all conditions control) technology on this football boot for accurate control. 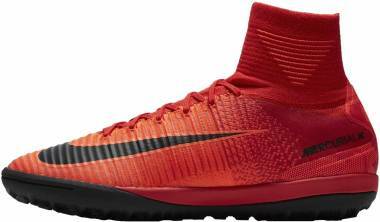 This red football boot is easily recognizable with its Solar Red colorway. It combines a white vamp with a bright red tinge that runs from the midfoot to the collar up to its outsole. It features a Techfit compression upper that promises zero wear-in time. It also utilizes a rubber sole unit meant to supply traction for artificial grass pitches. Asics has designed this cleat with a full fiery red look from the upper down to the studs. Built for players who prefer a “zero platform”, this red football boot offers a lightweight feel alongside superb responsiveness. It wears a combination of K-leather and Japanese synthetic leather for enhanced comfort and fit. It also relies on its PU (polyurethane) injection outsole for grip and release when playing on natural grass. Designed with a red blast on most of the upper part including the laces, Puma also incorporated some black and white on EvoPower 2.3 Firm Ground. This red football boot features a soft microfiber upper material and GripTex to enhance ball control. To further improve kicking accuracy, it utilizes the advantage of an accufoam lining. Its lightweight outsole allows the foot to bend just like in a barefoot-kicking motion. This soccer cleat steals the show in a vibrant University Red colorway with black graphics that show the brand name and logo. It flaunts a design meant to deliver a lightweight touch and excellent traction on the firm ground. A chevron cleat pattern facilitates explosive speed while speed ribs that line the upper enhance ball control. 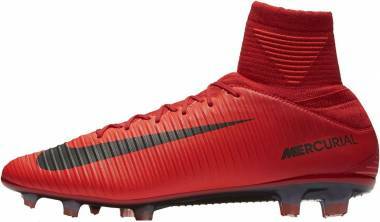 When it comes to fit, this red football boot gives the right amount of tightness as it wraps snugly on the feet. Care should start right when you take off your boots after each match. Unlace them right away. Do not pull them off by stepping on the heel of the boot with your other boot, it will damage the collar and will shorten their life. Make a habit of clapping your red football boots together sole to sole, to remove the turf and mud that were stuck on the studs. Never use a wire brush in removing the remaining dirt, it is too hard for the boots. Only use natural bristle brushes. Continue cleaning your red football boots by wiping them with a damp cloth. Avoid using cleaning agents as most of them are too strong especially on the leather uppers. Always remember that moisture is one of your boots’ enemy. Keep them dry including the inside by stuffing them with old newspapers. Too much heat can also ruin your red football boots. You need to dry your boots but avoid exposing them to direct sunlight. Extreme heat will damage the leather, crumble the glue that holds the seams together, and lose its grip. Heat will also twist or brittle the plastic soleplate of the boots. 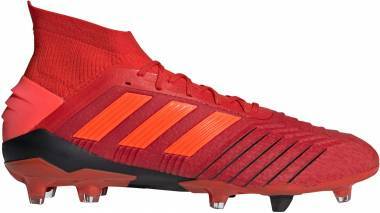 Black Football Boots vs. Red Football Boots: Which color is often worn on the field? Black is a hue often associated with power, elegance, and control. In the football boot world, black carries the standard color of the great classics like the Copa Mundial and Puma King. Black football boots have always been timeless, and players who fancy the elegance and style of a simple silhouette will go for black. Red football boots, on the other hand, are bolder and brighter, especially on the pitch. They suit players who don’t mind the attention and love the thrill of it all. To say which color dominates the pitch is quite a tough case to crack. Although black and red may seem to stand in contrast with one another, it cannot be denied that they work very well together when combined in a single colorway. 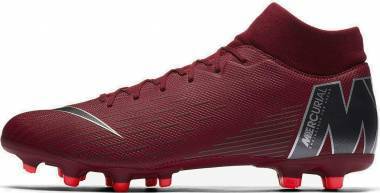 However, since black football boots have a lengthier history in comparison to red football boots, they may have more patronizers on the playing field. 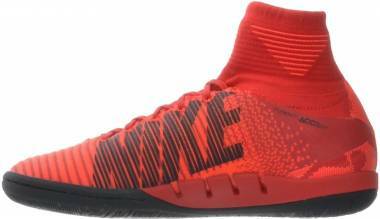 Aside from Adidas and Nike, what other brands offer men’s red football boots suited for indoor courts or turf pitches? 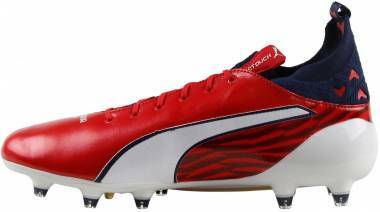 Puma also gives an excellent selection of red football boots for indoor and turf surfaces. One popular option is the Puma Men’s Invicto Sala in Red Blast. What was the first red football boot? Hummel first introduced a non-black football boot. They were the first to popularize other colors of boots including white and red. It was Charlie George who christened a red Hummel football boot. 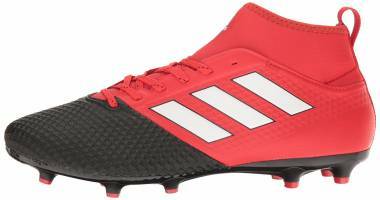 Which performs better, a red or a black football boot? Red, black, or whatever color, football boots from the same family carry the same genes and quality. How you care for your boots greatly affects their performance and life longevity regardless of its color.